This event will discuss the ways in which the SDGs can contribute to enabling frameworks for development, poverty eradication and greener economic activity through innovation, investment and partnership, at national and international levels. It will highlight practicality for and the contribution from U.S. companies doing business in globalized markets. The Green Economies Dialogue project (GED2) will focus on “green economy” and “green growth” aspects of the U.N.’s Post 2015 Development Agenda, the framing of U.N. Sustainable Development Goals and related UNEP and OECD efforts. GED is a platform founded in the run-up to Rio+20 for business engagement with governments, academia and thought leaders. It has issued a set of peer-reviewed academic papers on business-relevant aspects of Green Economy and has held several dialogue meetings in U.S., Europe, Africa, Asia and South America. Sahba Sobhani serves as the Acting Programme Manager of the Business Call to Action (BCtA), and Team Leader in the Innovation and Development Alliances Cluster of the Bureau for External Relations and Advocacy of the United Nations Development Programme (UNDP). He also serves as the manager of UNDP’s Growing Inclusive Markets Initiative (GIM), which is a research and advocacy initiative with a forthcoming 2013 Africa regional report on the role of enabling organizations in supporting inclusive businesses. Additionally, he is the lead author of the first GIM report, “Creating Value for All: Strategies for Doing Business with the Poor”, which was launched in 50 countries since July 2008 and translated in seven languages and the 2010 report titled “The MDGs: Everyone’s Business”. Sahba served as the first Interim Director of the UNDP Istanbul International Center for Private Sector in Development (IICPSD), which is in partnership with the Turkish Government, the first global center of its kind established with a major emerging country. Previously, he managed two key private sector initiatives in the executive office of the former Administrator of UNDP, Lord Malloch Brown, including the Commission on the Private Sector and Development headed by Paul Martin, the former Prime Minister of Canada, and Ernesto Zedillo, Mexico’s former President, and the African Financial Markets Initiative. In this capacity, he was the co-author of the “Unleashing Entrepreneurship” report, the seminal report of the Private Sector Commission produced at the request of then-UN Secretary General Kofi Annan and the managing editor of the African Stock Markets Handbook. 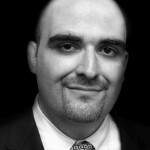 Sahba Sobhani has also worked in the private sector at Idealab in Palo Alto and Newscom Limited in Singapore. He is a graduate of Yale University and the Fletcher School of Diplomacy. David G. Victor is a professor at the School of International Relations and Pacific Studies and director of the School’s new Laboratory on International Law and Regulation. His research focuses on how the design of regulatory law affects issues such as environmental pollution and the operation of major energy markets. He is author of Global Warming Gridlock, which explains why the world hasn’t made much diplomatic progress on the problem of climate change while also exploring new strategies that would be more effective. Prior to joining the faculty at UCSD Victor served as director of the Program on Energy and Sustainable Development at Stanford University where he was also a professor at Stanford Law School. At Stanford he built a research program that focused on the energy markets of the major emerging countries—mainly Brazil, China, India, Mexico and South Africa. Earlier in his career he also directed the science and technology program at the Council on Foreign Relations in New York, where he directed the Council’s task force on energy and was senior adviser to the task force on climate change. At Stanford and the Council he examined ways to improve management of the nation’s $50 billion strategic oil reserve, strategies for advancing research and regulation of technologies needed for “geo-engineering,” and a wide array of other topics related to technological innovation and the impact of innovation on economic growth. 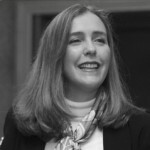 Paula Caballero currently serves as Director of Economic, Social and Environmental Affairs in the Ministry of Foreign Affairs of Colombia where she leads a multidisciplinary team that covers the major multilateral negotiations and agreements in these fields, including work on the Post-2015 framework. She developed and positioned the proposal on Sustainable Development Goals (SDGs) in the Rio+20 process and currently serves on the Open Working Group on the SDGs. Her professional background includes work for the United Nations Development Program (UNDP) in the Energy and Environmental Group, as Assistant Executive Director for the London-based Advisory Committee on Protection of the Sea (ACOPS), and as Sub-Director of FES Andean Program for Environment and Sustainable Development, amongst other posts. Ms Caballero has also served as Professor of International Law and International Environmental Law at Andes University, Colombia. 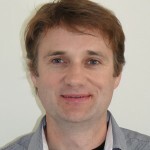 Niven Winchester is an Environmental Energy Economist at the MIT Joint Program on the Science and Policy of Global Change. Niven’s research focuses on analyses of climate and trade policies using computable general equilibrium modeling. Recent studies assess the effectiveness of border carbon adjustments, China’s trade-embodied CO2 emissions, and the ‘Food Miles’ debate. Prior to joining MIT, Niven held a faculty position at the University of Otago where he specialized in international trade issues. Niven has advised several organizations on international trade matters, including the OECD and the New Zealand Ministry of Foreign Affairs, and was a lead researcher on a recent European Commission project on non-tariff measures in international trade. Niven also has an interest in sports economics, particularly sports ranking systems. Remarks by Paula Caballero, Counsellor, Ministry of Foreign Affairs, Government of Colombia, during the GED Luncheon Roundtable’s panel discussion on The SDG’s–Enabling Frameworks at the International Level–Finance, Investment, and Technology Deployment. Remarks by David Victor, Director, Laboratory on International Law & Regulation, University of California, San Diego during the GED Luncheon Roundtable’s panel discussion on The SDG’s–Enabling Frameworks at the International Level–Finance, Investment, and Technology Deployment. Remarks by Sahba Sobhani, Program Manager, Business Call to Action, UN Development Program at GED Luncheon Roundtable during the UN General Assembly on Enabling Frameworks at the International Level and on the Business Call to Action. Remarks by Niven Winchester, Environmental Energy Economist, MIT Joint Program on the Science and Policy of Global Change on GED’s luncheon panel on The SDG’s –Enabling Frameworks at the National Level– Job Creation and Infrastructure. On September 26, USCIB members met on the margins of the UN General Assembly with government and UN representatives to discuss US business priorities in the UN’s new development agenda and UN goals for sustainable development. Hosted by Pfizer, the day of policy consultations included a Green Economies Dialogue Luncheon Roundtable on green growth aspects of the SDGs. 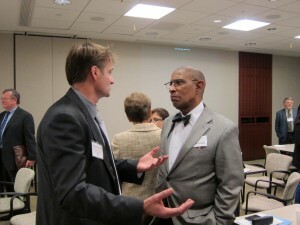 Below: Clifford Henry, Procter & Gamble (right) speaking with Niven Winchester, MIT at Green Economies Dialogue on September 26th, New York. The USCIB delegation was led by Clifford Henry, Procter & Gamble, and Chair of USCIB Corporate Responsibility Committee. “USCIB members are arguing for a strong focus on peace, security, good governance and economic growth in the SDGs,” said Mr. Henry. These and other fundamental priorities underpin enabling conditions for job creation, environmental stewardship and economic development. USCIB members underscored the need for open trade and investment and strong Intellectual Property protection as prerequisites for the deployment of business, financial, and technical expertise to advance development and address international challenges of energy access, food security and poverty eradication. Other companies taking part included American Chemistry Council, Diageo, Exxonmobil, General Electric, and Pfizer. In the morning, USCIB members met with Ambassador Takehiro Kagawa, of the Japanese Ministry for Foreign Affairs, and Daniella Ballou-Aares, Special Advisor on Development to the US Secretary of State. In the afternoon, Karina Gerlach, of the Secretary General’s High Level Expert Group for the Post-2015 Development Agenda and Dr. Shamshad Akhtar, UN Assistant Secretary General for Economic Development briefed the group on workstreams that make up the UN-wide effort – including the Experts Group on Finance for Sustainable Development, and suggested ways to involve business in these deliberations. In his opening speech to the Green Economies Dialogue Luncheon Roundtable, Peter Robinson, USCIB’s President and CEO, stated that, ”Events like this one are an opportunity to advance a common agenda of prosperity and betterment of the human condition.” Speakers from MIT, the US State Department, the UN Development Program (UNDP), University of California, San Diego and the Colombian Ministry of Foreign Affairs provided their perspectives on ways to prioritize and track economic aspects of progress under the SDGs, and the opportunity to engage business communities in developed and developing countries in partnerships as part of the UN Post-2015 development deliberations. The Green Economies Dialogue is a platform created by USCIB and the US Council Foundation in the lead-up to Rio+20 for business to engage with national governments, thought leaders, representatives of international institutions and academics on green growth and green economy issues. The second phase of the Green Economies Dialogue will concentrate on interaction with governments and the UN around the Post-2015 Development Agenda, especially concerning greener economic development and the formulation and pursuit of the Sustainable Development Goals. The UN will frame a new Post-2015 Development Agenda and begin negotiations the Sustainable Development Goals for completion in 2015. These Goals are anticipated to drive UN activities, direct national budgets and influence stakeholder expectations in coming years, across a wide range of strategic issues, such as corporate responsibility, environmental regulation, and energy. 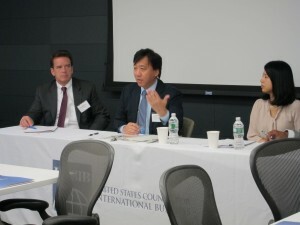 USCIB’s SDG Working Group is led by Brian Lowry, Monsanto and Tam Nguyen, Bechtel.